Do you have a certain image in mind when you hear those words? Those images are one of the reasons for filming in 1996, the year of the welfare reform. 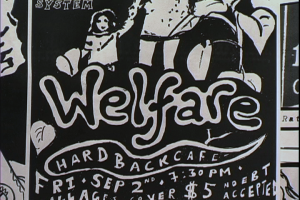 See who these “welfare moms” really were back then and how they changed in part 9 of All’s Well and Fair II (2006 version). This is a transmedia documentary so we want YOU to actively participate in telling the story! Share your thoughts via video response or comments. To get you started: What are some of your thoughts about welfare? I recently graduated from Hampshire College in Amherst, MA and I think this documentary would be incredibly appreciated on campus. Of particular interest to you all might be the option of having a screening and discussion at the Civil Liberties and Public Policy conference which takes place on campus every year. Here is a link to the conference page: http://clpp.hampshire.edu/ It’s just an exceptional program focused on bringing people together from all over the world to discuss the intersections of politics, poverty, discrimination, and women’s health (and many more things). If you are interested in having a screening and discussion/workshop, I could contact the program for you as an alum. Let me know if you’re interested (themusicsnob@yahoo.com) and thank you AGAIN for creating this wonderful platform for discussion and this exceptional documentary. So powerful. Thank you so much for your wonderful comment and the suggestion to screen at the Civil Liberties conference. That would be fantastic. I’ll be in touch with you via email.